When States Asked For Insurance Waivers, They Didn't Like The Answers : Shots - Health News When states applied for waivers from Obamacare rules to reduce premiums and strengthen their insurance markets, they didn't get the answers they wanted, prompting some to suggest a conspiracy. The Washington Post reports that President Trump, shown here with former Health and Human Services Secretary Tom Price, personally intervened to delay approval of Iowa's waiver application. Emails flew between the Centers for Medicare and Medicaid Services in Washington and Oklahoma's Department of Health. Blue Cross Blue Shield of Oklahoma, the only ACA insurer in the state, was on board. Everything had to be done by Monday, Sept. 25, so the insurance company could set new, presumably lower, health insurance rates for 2018. Just before 6 p.m. on Friday, Sept. 22, CMS sent along a draft approval letter saying it expected an approval to be released the following Monday. Instead, Sept. 25 brought more questions from the agency and more reassurances. "We don't necessarily see this issue as a barrier to approving the application today," reads one email from a CMS employee and provided to NPR by Oklahoma officials. But the approval never came and the deadline to cut insurance premiums for 2018 passed. Oklahoma withdrew its application. JUST OUT: Trump Admin fails to provide flexibility to Oklahoma in 1332. "While we appreciate the work of your staff, the lack of a timely waiver approval will prevent thousands of Oklahomans from realizing the benefits of significantly lower insurance premiums in 2018," Oklahoma Health Secretary Terry Cline wrote in a Sept. 29 letter to former Health and Human Services Secretary Tom Price and Treasury Secretary Steven Mnuchin explaining why the state was withdrawing the application. That angry letter lit up Twitter with speculation that the Trump administration was so intent on undermining the ACA to force Congress to pass a repeal bill that it would even cross a Republican state. Oklahoma's situation isn't unique. Of the eight states that have applied for waivers under the Affordable Care Act to strengthen their health insurance markets, only two have been granted in full — one before Trump took office and one just days after he was sworn in and before his Health and Human Services secretary was confirmed. Two other applications remain incomplete, but several have been plagued by delays and partial approvals. 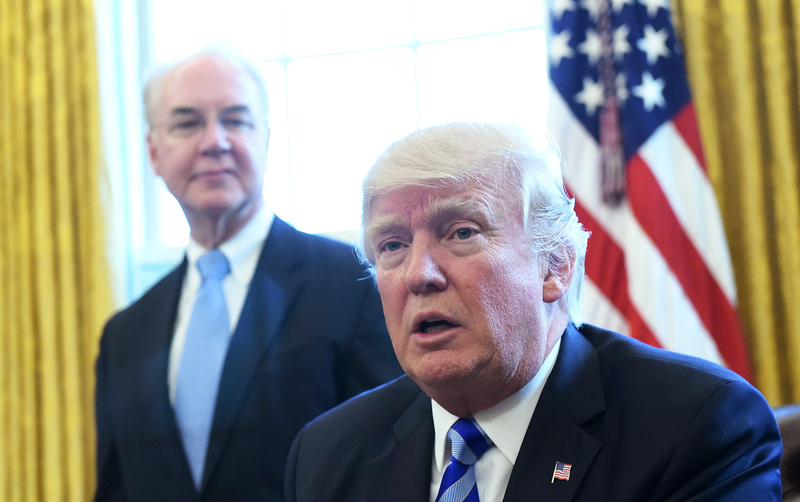 Some health care analysts say the delays and denials are part of a pattern of actions by the Trump administration to undermine the ACA insurance markets. "The Trump administration has been promising state flexibility," says Andy Slavitt, former acting director of CMS. "But in the case of Oklahoma, rather than respond in a timely way, by not responding, they chose instead to drive up premiums for millions of Oklahomans, presumably to sabotage the ACA." But Larry Levitt, senior vice president at the Kaiser Family Foundation, says waiver applications can be complicated. "On the one hand, there are legitimate issues about whether these waivers meet the requirements of the law, so taking time to review that is not unreasonable," he says. "On the other hand, it does appear that the states have been getting mixed signals from the administration." CMS declined to answer questions about the waiver decisions and email exchanges. Former Secretary Price, who resigned last month, and CMS Administrator Seema Verma encouraged states to apply for the waivers. Just weeks after he was sworn in in February, Price wrote a letter to every governor in the country to urge them to consider creating reinsurance programs and high risk pools through what's known as a 1332 waiver, named for the section of the Affordable Care Act that authorizes them. HHS "invites states to pursue approval of waiver proposals that include high-risk pool/state-operated reinsurance programs," the letter says. "The Departments will work with states to review all applications within the timeframe provided ... and do our best to work with state to review their applications on an expedited basis." But that's not how it appears to have played out. The Washington Post reports that President Trump personally intervened to delay approval of Iowa's waiver application. The state asked to create a reinsurance program to protect insurance companies from losses when patients suffer unusually expensive illnesses. The state also wanted to create a separate set of insurance plans outside the ACA marketplace. Together the measures would cut premiums by as much as 80 percent and stabilize that state's market, Insurance Commissioner Doug Ommen told Morning Edition. "I don't speak to the president, so I really don't know what the story is behind this," he said. "It does seem that we are having some difficulty getting to a solution." The state is running out of time to implement its program, called the Iowa Stopgap Measure, for next year, Ommen said. "The closer it gets to open enrollment, the harder it is for the stopgap to work," he said. Another state, Minnesota, did get an answer to its request. But it wasn't the answer state officials expected. CMS granted half of Minnesota's waiver request, allowing the state to create a reinsurance system. But at the same time CMS denied a request from the state to leave funding for its basic health program for the working poor intact. Minnesota Commissioner of Human Services Emily Piper says the state was shocked by the rejection. "We bounced the language off them about how to make reinsurance work and how to hold our basic health plan harmless," Piper says. "We worked really closely with various experts at CMS. We wrote our legislation a certain way, we wrote our waiver application a certain way. And we followed all of the directions and guidelines that CMS put in place along the way." Emails between CMS and state officials bear that out. One note from a CMS staffer describes exactly what language should be included in Minnesota's state law authorizing the reinsurance program. "To be clear, the BHP (basic health plan) funding *will* go down. However, the pass-through will go up an extra amount to account for that," the CMS staffer says in the email to Minnesota state Sen. Michelle Benson. The staffer adds that he edited the language in the state's draft legislation to ensure Minnesota achieved that result. Piper, the health commissioner, says they not only worked on the language with CMS, but also told the agency multiple times that the state needed the waiver approval in August so it could prepare its markets for open enrollment, which starts in November. Minnesota didn't get an answer until late September. "We were trying to reach out during that time period. The governor was seeking to get a hold of [HHS] Secretary Price and [CMS Administrator Seema] Verma," Piper recalls. "There was a period of several days where at the highest levels we were unable to make contact with Secretary Price and Admin Verma." She says the state was stunned that the answer took so long and even more shocked when CMS rejected their request to protect the state's Basic Health Plan, which now stands to lose $369 million in federal funding over two years. "I'm not sure why this has been states' experience," Piper says. She acknowledges the process of getting a waiver is complex, but says the results seem politically motivated. "With regard to the ACA, when the president makes comments on Twitter that express an intent to compromising intentionally the ACA, it certainly feels like one potential is that there is an intentional political calculation here," Piper says. Despite these experiences, states could find relief soon. A proposal to stabilize insurance markets by Sens. Lamar Alexander, R-Tenn., and Patty Murray, D-Wash., would add flexibility to the state waiver process. Several paragraphs of the draft legislation appear to be geared specifically to the Minnesota situation by adding protections for basic health program funding from the federal government. And more generally, the bill would cut the wait time for waivers to be approved, allow states to go ahead with just the approval of the governor rather than a vote from the legislature, and it would make it easier for states to get copycat waivers once a program has been approved elsewhere. However, the bill has yet to be scheduled for a committee hearing or a floor vote. And it is unclear whether it would pass the House or get the support of the president.